Chimney Relining, Donegal. 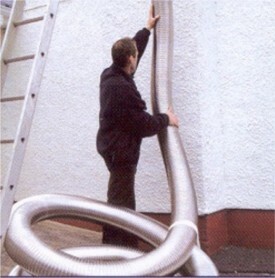 Flexflue flexible chimney relining system - robust, secure & designed to last with a 10 year guarantee - Futureflue, Ireland. The chimney relining industry recognised the need for a more secure option to solve chimney problems. The installation of a Flexflue relining system is robust and secure and designed to last. Flexflue offers a 10 year guarantee, which demonstrates a belief in the system and commitment to customers. Cracked or broken liners are discovered which may leak fumes or smoke. The householder is looking for peace of mind that the smoke & fumes are being removed from fire as efficiently as possible with minimum risk of carbon monoxide entering rooms in the property. Experienced and trained staff with specialist training and knowledge of chimney problems. Comprehensive survey and survey report detailing the problems with the chimney and any other associated problems or issues contributing to the problem. Fast and convenient method of relining in comparison with other chimney relining or repair solutions. Usually the least expensive option in terms of chimney relining. Often no opening of walls and minimal disruption during installation. Futurflue can assist with the handling and processing of insurance claims. 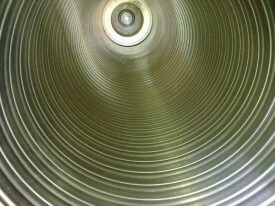 Flexflue provides a ten year guarantee on the Stainless Steel Flexible liner product installed. In addition Futureflue guarantees all its workmanship and in the unlikely event of a complaint this will be dealt with promptly. Futureflue are fully insured to carry out relining installations and all staff have undergone Health & Safety training. No joints to leak as this is a continuous one piece flexible flue liner from the top to the bottom of the chimney with no joints or sockets along the length of the flue. A fixed internal diameter reduces the risk of reductions in size throughout its length allowing the smoke & fumes to flow freely up the chimney. Having as a small thermal mass the liner will warm quickly allowing very little condensation to form when the fire is first lit. As the Flexflue® flexible chimney liner is normally installed inside the clay liner, attached to the chimney pot with the space between the two liners filled with vermiculite insulation, this will help to retain the heat in the flue and increase the draught on the chimney. Reduces the risks of carbon monoxide poisoning.